Hamas telecommunications officials claimed Wednesday an IDF bulldozer damaged a communications cable and cut all phone and Internet networks in the Hamas-controlled Gaza Strip. 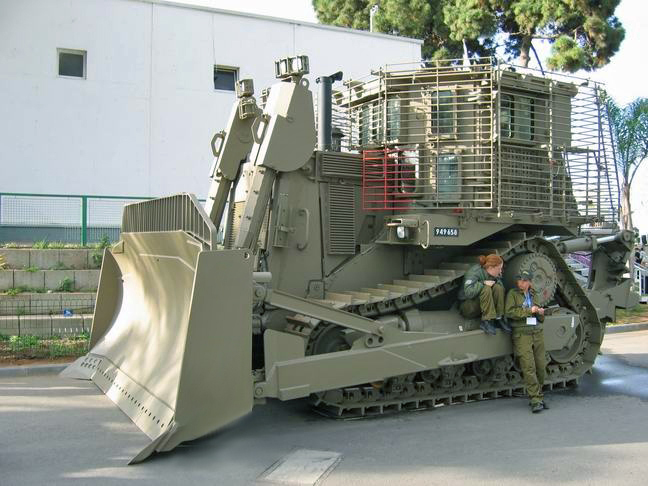 An Israeli armored Caterpillar D9R bulldozer in Israel. Its armor allows it to work under heavy fire. The blackout was reportedly caused late Tuesday by a military bulldozer operating in Nahal Oz, close to the Hamas terror enclave. Dontcha just hate when accidents happen ? “Repairs have allowed the gradual resumption of communications,” the officials said. Don’t help them with anything ! Leave the genocidal scum unable to communicate. The peace loving telecom system can rot. Let their fantastic tops-of-their-classes Wyle E. Coyote Super Genius ‘Muslim Scientists’ take care of fixing the accident. Hey, it was an accident…… Wasn’t it ? This entry was posted on Thursday, August 11th, 2011 at 07:16 and is filed under Main Postings. You can follow any responses to this entry through the RSS 2.0 feed. You can leave a response, or trackback from your own site. One Response to Call before you dig. Where was Rachel Corrie when you really needed her?